First up is the B-2 Blitz from Bomber & Company— a miniature knife designed by the company’s backers! Using the input form over 1,000 surveys and 22,000 backers, Bomber & Company created this knife, which features 440 Carbon stainless steel, a serrated edge, and Tanto blade point. It measures up at a mere 3.7 inches, making it lightweight and practical, and is available on Kickstarter for just $50. If you’re looking for a simple, elegant tool for the campsite or the backwoods, look no further than the Barebones Japanese Nata Machete. With a comfortable walnut handle and a full-tang stainless steel, 12-inch blade, this machete is designed to withstand years of hard use. It also features copper accents, and a Japanese-inspired design. Available on Amazon for $65. Fulcrum blades has created what might be the smallest and most adorable of knives in the outdoors market—the Eclipse coin knife. It morphs from its Liberty-dollar-sized, coin-shaped carrying form to a small but easily-gripped knife excellent for your everyday needs. In it’s folded state, it also acts as a bottle opener, making it even more useful. Available for preorder on Indiegogo, starting at $39. 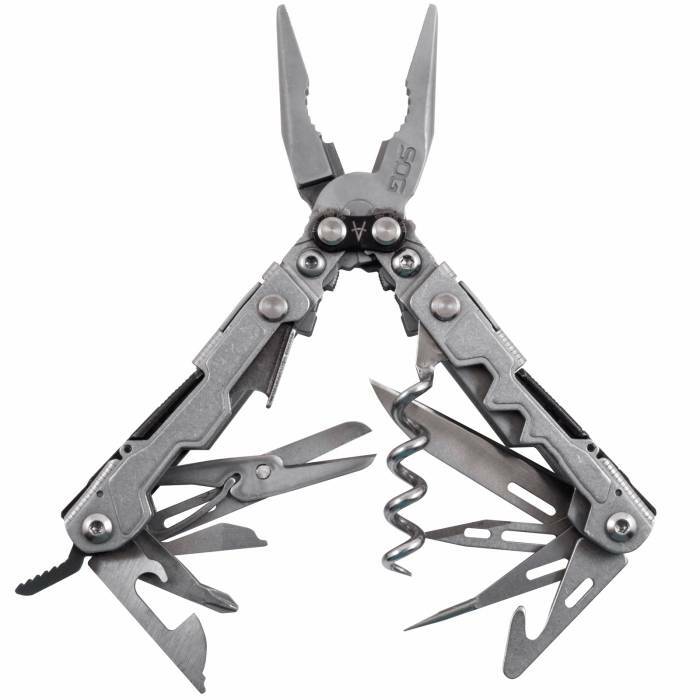 Last, but not least, we have another true multi-tool—the SOG PowerLitre multitool. Weighing in at a mere 4.6 oz, it packs a powerful punch. Featuring 17 distinct tools, the PowerLitre keeps its usefulness wrapped tight in a lightweight and portable package. Available for $49.95 on SOG’s website.